Check the mounting conditions (looseness, backlash) of each component. Verify the component conditions (wear, damage) are normal. Set the front wheels in a straight-ahead position. 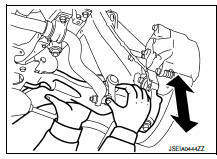 Hold the axle side of the transverse link, and check the axial end play by move the transverse link up and down. Do not depress the brake pedal when measuring. Do not perform this inspection with the tires on the ground. Be careful not to damage ball joint boot. Do not damage the components by applying excessive force. Check for oil leaks or damage. Replace the parts if necessary.